Since this letter is indicative of the common misunderstandings of the 2012 NDAA coming off of Capitol Hill, we have decided to respond. Read the original letter here. Though the NDAA is typically the vehicle chosen to fund our Armed Forces, it does not have to be. In an Op-Ed in the New York Times, two retired four star generals noted that the 2012 NDAA “can be vetoed without cutting financing for our troops,” and urged the President to do so. Indeed, a separate bill was introduced to fund the military, without the detention provisions in the 2012 NDAA, and that bill was voted down. Even more practically, if funding the military is as important to the Congressman as he claims, the entire text could simply be copied into a different bill since, like all budgetary bills, the NDAA begins in the House. It may require more votes, but if extra votes are what stands between your Congressman and your right to a trial he shouldn’t be in office. “As a true Constitutional Conservative, I understand and have a great appreciation for the importance of protecting our right to privacy. When first examining the bill, one of my top priorities was to refuse supporting any type of program that trades our guaranteed civil liberties for the promise of security. While we applaud the intent of Rep. Hudson to support amendments that supposedly protect the rights of American citizens in spite of the 2012 NDAA, he voted against the only amendment that would truly repeal the detention provisions for all persons just last year. The Smith-Gibson amendment, the only 2013 amendment supported by PANDA, failed on the house floor by only 26 votes…one of which was Congressman Hudson. “While we’re sympathetic to the intent behind Gohmert-Rigell-Landry, their amendment does nothing to improve the underlying bill. 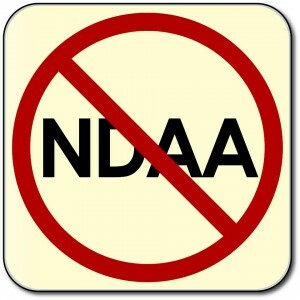 The amendment states that the NDAA doesn’t “deny any Constitutional rights . . . [to a person] who is otherwise entitled to . . . such rights.” Put simply: if you have constitutional rights you have constitutional rights. Obviously, that doesn’t protect Americans’ rights or change existing law. It does nothing. The Gohmert Amendment was the only survivor of our successful fight against 3 amendments to the 2012 NDAA, mere smoke and mirrors that make things worse, and it does nothing to protect the rights of any person, or American citizen, here in the United States. To call this provision a “protection” is quite the stretch. It simply requires that a report be sent to Congress, the same Congress that wholeheartedly voted for the 2012 NDAA 283-136 in the House, and 93-7 in the Senate, the same Congress that sat by and did nothing while 120,000 Japanese-Americans were detained under Executive Order 9066, and the same Congress that, time and time again, has refused to pass meaningful amendments to the 2012 NDAA’s detention provisions. This Congress will get a report on who was detained. Congratulations. Further, this is only a report. Referring to a report as if it were a protection is like referring to the receipt as saving you money. As an American citizen, you are now sitting in military prison for a crime you did not commit, and at least Congress gets a report on you. This is not a protection, it is smoke and mirrors. The receipt for your military detention has been given to the same people who authorized it in the first place. Until Congress actually prevents unlawful military detention, there is no protection, only platitudes and form letters, and we inch ever closer to a repeat of a WWII style mass incarceration. Since Congressman Hudson is unwilling to defend your right to a trial, it may be time to replace him with someone who will. Dan Johnson is the Founder and National Director of People Against the NDAA.